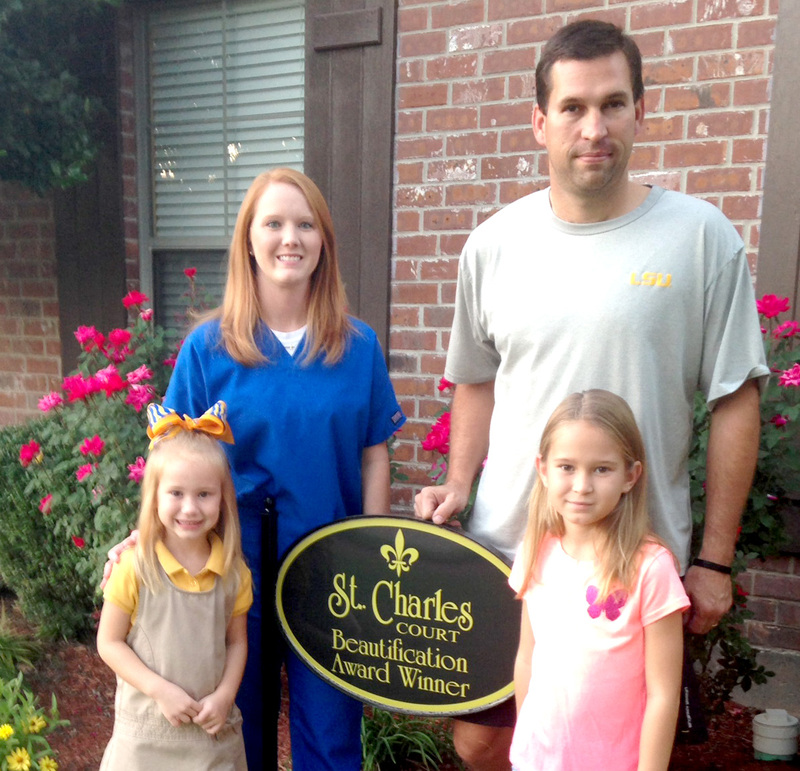 Michael and Wendy McMillan with their daughters, Mallory and Madelyn, are October’s St. Charles Court Beautification Award winners. Michael and Wendy McMillan of 408 Magazine Court are this month’s winners of the St. Charles Court Beautification Award. Their efforts to maintain and to improve the appearance of their lawn and landscaping is apparent all year as they build on what the previous owners of their lovely home already began with neat and clean management of their trees, shrubs, flowering highlights that change with the season and their constant attention to the details of a properly managed lawn. Wendy states that she receives much assistance in her choice of seasonal plantings from her friend and neighbor, a previous Beautification Award winner, Lauren Johnston. They are quick to point out their love for the community of St. Charles Court and St. Charles Court Village. Having two daughters, Mallory and Madelyn, they were drawn to purchase their home in May of 2012 by the friendliness of the neighbors, the schools, and the security of living in a gated community with special amenities offered such as the community pool and accompanying clubhouse, only two blocks away. A short walk to a refreshing dip in the pool during the summer, as well as an opportunity for their children to establish many friendships which they anticipate lasting a lifetime, prompted Wendy to emphatically state “We absolutely love it here.” Their nightly jog around the neighborhood and the daily walking of their loving dog, Hudson, is noted as only a couple of the activities they enjoy daily, resting assured that they do so in a safe, well lit community where safety and security is cherished.